I have been a member of the Varulam Amateur Radio Club for about five years now. Before I even became a member I was nobbled to become a member of the committee! As I am a keen CW (morse) operator, I was very interested to visit the club at it's cabin location on the top of Dunstable Downs. On this occasion they were operating in a 48 hour CW contest over one weekend with three stations on the go throughout the day and night. So being keen I turned up on the Friday to help set up the aerials and winch up the towers, operated in some early morning slots in the contest and then helped them 'tare down' the set up afterwards. At that time the contests were being organised by David G3YYD, and this was his last venture with the club prior to his move away from the area. So the club was loosing its contest manager and they were looking for somebody to take the role on. Never being one to say no, I got the job!! So for the past four years I have been contest manager for the Verulam Amateur Radio Club. When I started I had next to no experience with contesting, so it was a steep learning curve for me on that front. At the time there was the annual CQ WW CW contest (which is the one I got involved in on that occasion) and two or three others that they did regualarly. Since then I have involved the club in the RSGB's (Radio Society of Great Britain) Club Championship Contests and the Autumn series of contests as well. Both these series of contest run over a number of months (CC contest for 6 months of the year and the Autumn series for 3 months). Each month of the contests consists of three individual contests, one SSB, one CW and the other Data. These all take place on the 80m band from 8pm until 9.30, so they can be done over that short period without interfering with life too much! What is really very about these contests is that multiple members of the club can take part, with all there scores being added together to support the clubs final score. To my mind this gives the added dimension of members of the club getting involved together and striving to bolster our score, so adding to the sense of commaradery that you get. The Verulam Club has it's own website which is run by our secretary Greg M0MMG. 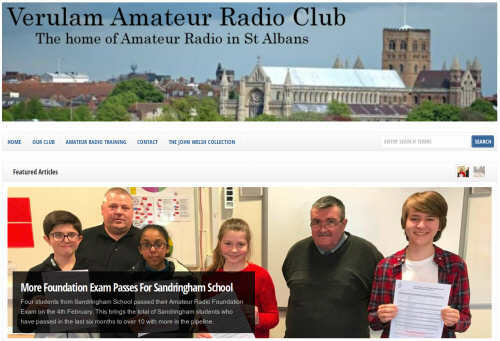 He also is very much involved with running our training program for anyone looking to join the ranks of the radio amateur or looking to upgrade their licence. We are alway very happy to see new faces at our club meetings, so if you would like to come along and find out more, then you would be most welcome! If your not sure who to contact, then feel free to email me, [email protected].